Bravo’s series of Top Chef shows has showcased several chefs who’ve subsequently turned up on the “must” list for The Restaurant Dieter and the TRD Spouse. On a Top Chef Masters, Anita Lo of Annisa performed so consistently week-to-week that, though she did not win, we sought out her exceptional New York restaurant. Annisa’s grapefruit “soup”dessert is unmatched in my hall of fame. This past season brought us Naomi Pomeroy of Portland’s Beast. She was among the youngest of competitors, disdained the formality of the chef’s jacket, consistently performed well and captivated us. Though she did not win, her French toast in an episode in which the chefs had to cook for contestants from the television show, “The Biggest Loser,” looked great. On a recent visit to Beast, we found her much as she appeared on television. Her reddish brown hair was pulled back conservatively, but she sported trademark dangly earrings and a lacy black blouse over a black tank. At the bottom of her skinny jeans were chef’s clogs, tapping to the ’80s music as she and her team set up for the latest of her two seatings. Beast can accommodate 24 seats at two communal tables. We reserved for the 8:45 p.m. seating. Because there’s no place to wait outside, we had a drink at a restaurant down the street. It apparently happens frequently, according to our waiter. We joked that the other restaurant should call itself “Pre-Fix” and offer starters to complement Pomeroy’s weekly changing menu. Eating at Beast is an act of faith. A diner gets what Pomeroy puts on on her six-course menu. And if there’s any doubt, there’s a note at the bottom that says, “substitutions politely declined.” She wants to cook her food, and you can like it or not. No effort is made to accommodate a dieter. That raises questions about why The Restaurant Dieter would eat there in the first place. The answer takes the form of a couple of simple questions: What could be learned by eating at the same few restaurants with healthy fare over and over again? And what incentive would restaurateurs have to improve if they received no feedback from dieters? So on that basis: We had an awfully good meal that I can’t begin to tally nutritionally. Nor would I try. At more than $200 for a couple plus tip — one of us had the wine pairings — this is not something one does every day. And an occasional splurge seems warranted if one eats sensibly most of the time. 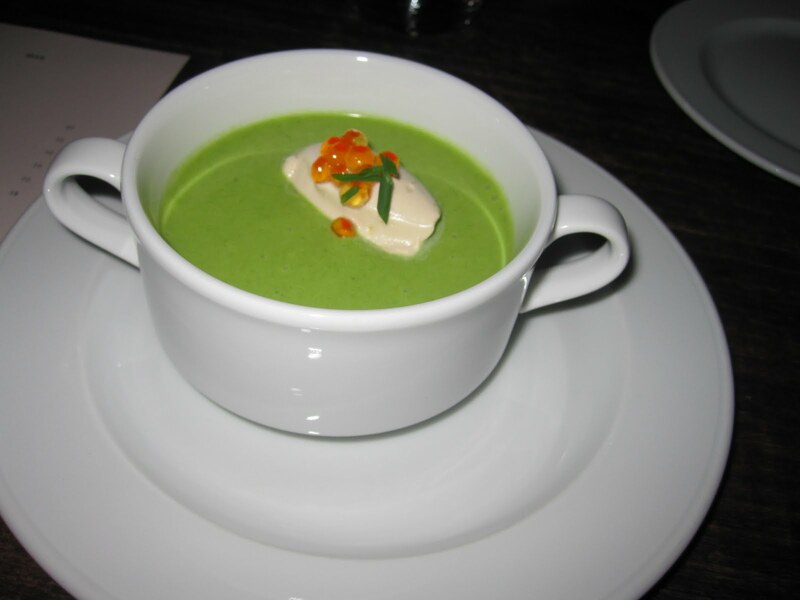 The first course was a cold, spinach and sweet onion soup with a velvety base, a dollop of lobster cream and some sake-cured steelhead roe. It was hard to decide whether to stir all the lobster cream into the soup, or hold it in reserve as a splendid finish. A chartcuterie plate followed with a single bite of several items. 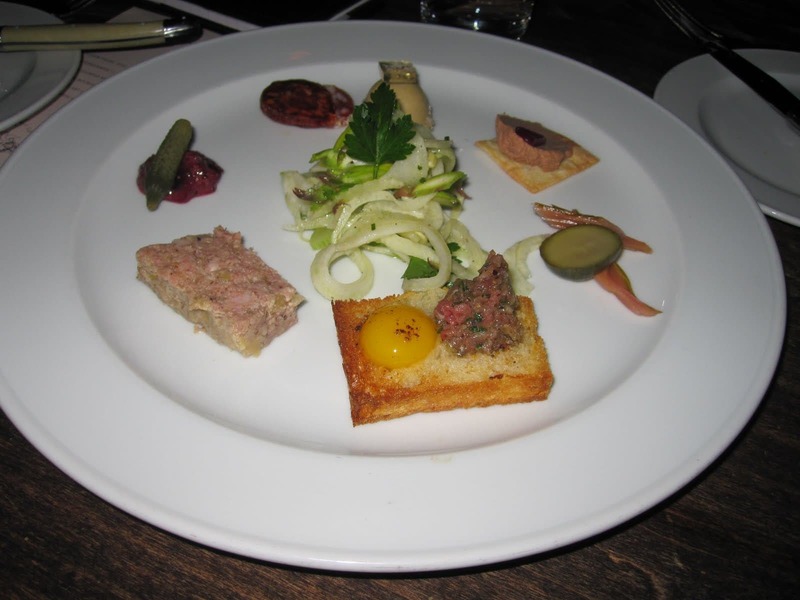 The highlights were a well-seasoned steak tartare on toast with a delicate quail’s egg. The foie-gras bon-bon might just as well have been a creamy milk chocolate; it was that good. This from a diner who typically does not like foie-gras. 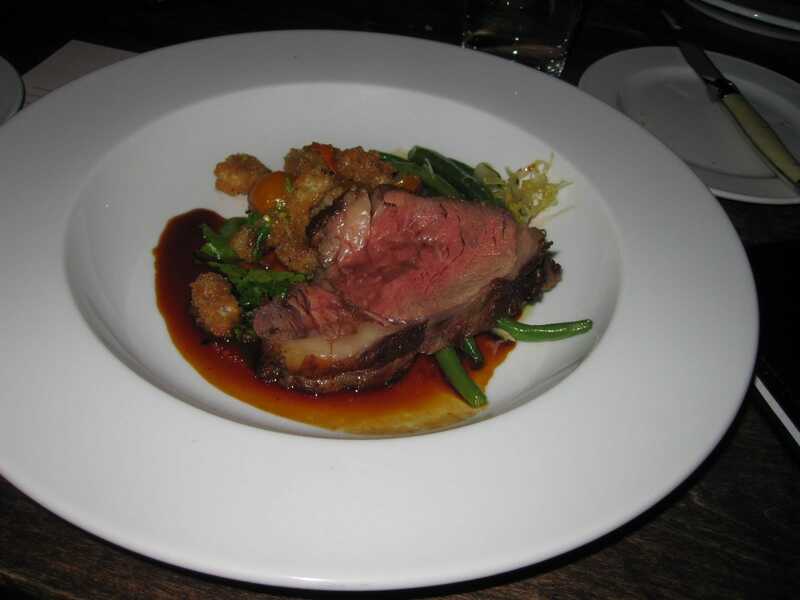 The main of mesquite-grilled, grass fed Carmen Ranch ribeye sat in a sauce that was too heavily salted, with a bread salad and green beans. It wasn’t inedible, but overbearing. And given the addictive properties of salty food, a potential deal breaker. 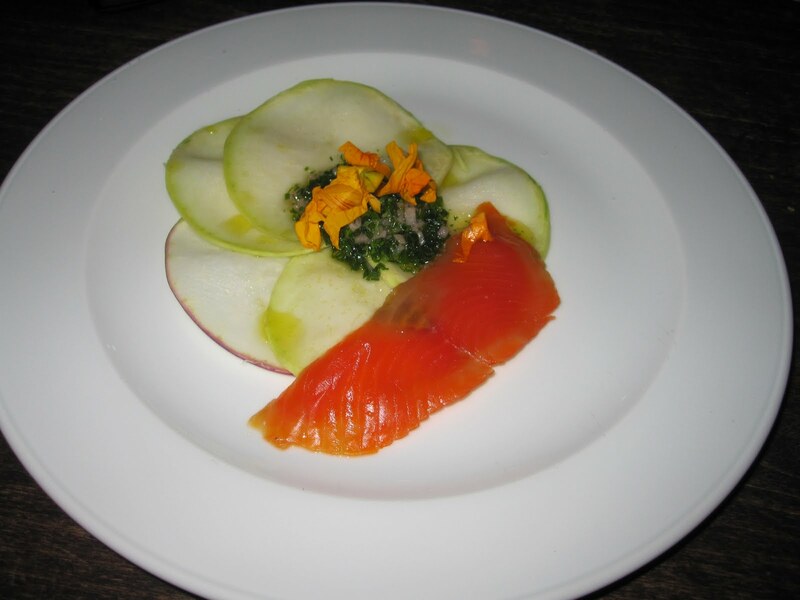 A salad of thinly-shaved kholrabi, lovage-cured salmon and a preserved lemon salsa verde was the most creative I’ve seen in some time. It left me wanting more, though it there was a tad too much oil on the plate. Chastened by the “no substitutes” rule, I did not request any changes. But I imagine that the kitchen might have been willing to put the oil on the side. Next time, I’ll test that. Courses five and six were a perfectly ordinary cheese tasting and a tayberry and golden raspberry trifle with a rich malt ice cream. In a world where restaurants have abandoned cakes (other than chocolate), it was a welcome relief. 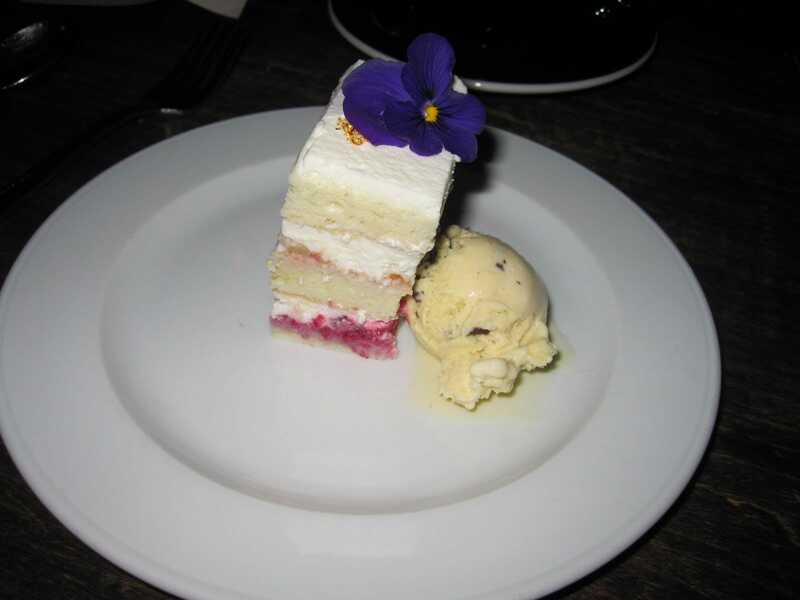 The yellow cake was dense and rich, with a nice moist crumb, but light. It was a small enough portion that even a dieter could feel pretty good. If you behave yourself most of the time and consider Beast an occasional treat, you have my full permission to go. Review: Voodoo Doughnuts, Portland, Ore. Being a food tourist is a dangerous business. It inevitably leads to poor judgment. That’s how one winds up eating a thousand calorie slice of pizza in Chicago, or a greasy cone of fish and chips in London, or a Philly cheesesteak in…Philly. That’s my excuse, and I’m sticking to it. Why else would a writer/blogger called The Restaurant Dieter wind up at the most talked about Portland food establishment? Voodoo Doughnuts. This joint features a doughnut topped with maple frosting and two slices of bacon. There is no hope of diet here, unless you count that it has vegan offerings. But diet as in low fat, low sugar? Hardly. That you can special order a coffin full of Voodoo’s specialities seems apt. Somewhere out there are Voodoo’s victims, including a few folks in line that were wearing “early stroke,” “early heart attack” signs as surely as their XXXL T-shirts. But who are we to talk? The Restaurant Dieter, the TRD Spouse, his brother and sister-in-law dropped by the Voodoo Doughnuts too to get a snack before heading to the Portland Rose Gardens. So we were just going to get a taste. You know, one little indulgence. But standing in line for 20 minutes scanning the huge menu is an exercise in thwarted desire. So by the time we reached the counter, our order required a box. We had to have a couple of the maple bacon, of course; there were four of us after all. The cake doughnuts coated in frosting and topped with mini M&Ms looked good. The chocolate cake ones with chocolate frosting and Cocoa Puffs (“Triple Chocolate Penetration”) had to be ordered, if only for the conversation value. And who could resist the peach fritter with cream cheese frosting? Once outside, we ate in a blind fury. Ten minutes later, we surveyed the nearly empty box and canceled the Rose Gardens. We had to get back to the hotel before the sugar buzz became a sugar coma. Oh, did I mention that the TRD Spouse and his brother were in Portland for a triathlon? 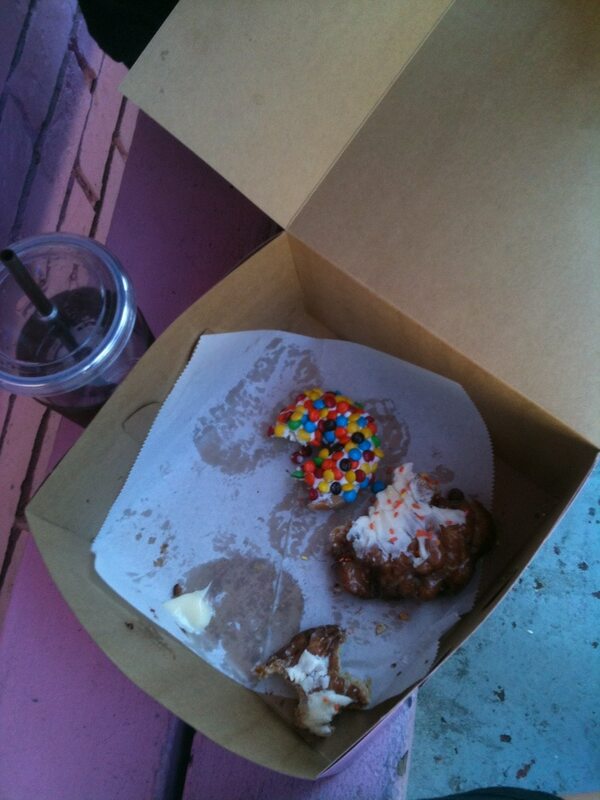 And that at the race the next day, the only available food for sale to the public was…Voodoo Doughnuts? “Everything,” replied the server, who was, shall we say, on the large side? ﻿﻿﻿﻿He’d been asked “What’s good, low fat, light and healthy?” This was The Restaurant Dieter’s first experience with Peruvian food. The TRD Spouse had wanted to explore boho Portland’s Pearl District, a gentrifying warehouse area that now sports modern furniture emporiums, $30 Woolrich T-shirts and even a place that specializes in outfitting all your sheepskin needs. 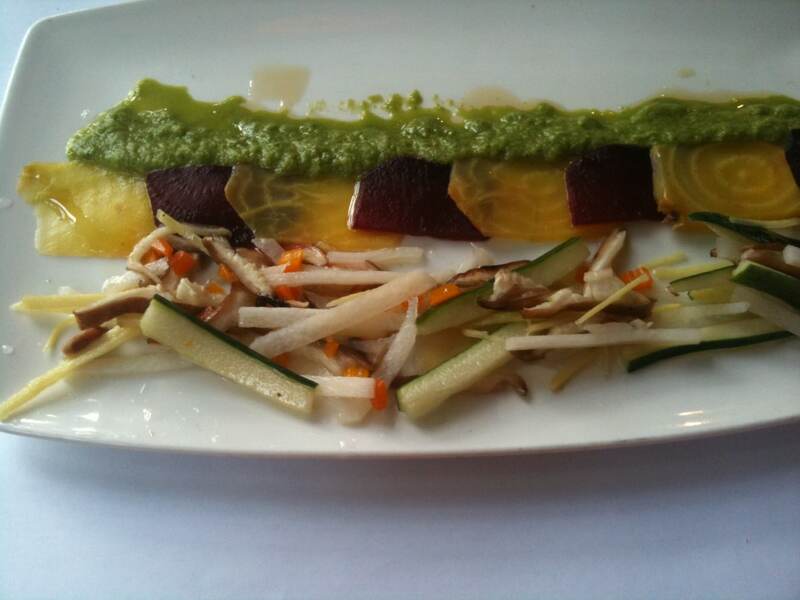 We’d found Andina on Yelp searching for “vegetarian,” which it most certainly was not. And given the server’s response and build, confidence waned. But a lunchtime visit turned out to be a pleasant surprise. Everything was not light, low fat and healthy or vegetarian, but there were more than enough good choices. 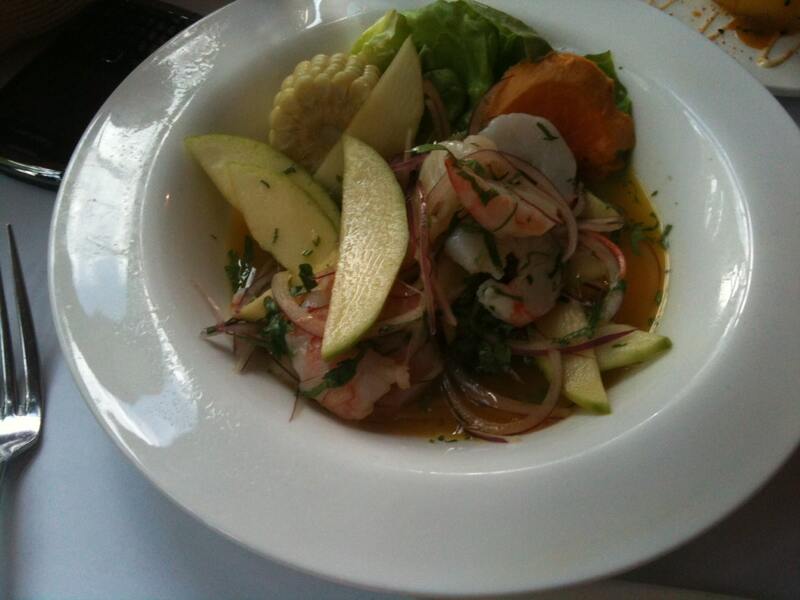 A ceviche — cebiche on Andina’s menu — is always a safe bet. Being able to choose from four, including a catch of the day that rotates, seemed a miracle. The green mango with passion fruit and prawns ceviche also featured some red onion and, in a lovely twist, a small corn cob, barely cooked if at all, and a chunk of sweet potato. Mixing the kernels and sweet potato chunks into the rest of the mixture added a depth to the sweet-and-hot passion fruit broth and a crunch. Although listed as a small plate, it’s really enough to classify as a main in any country other than the United States. An extensive list of 28 plates suitable for tasting and sharing could be ordered in three sizes: $9.50, $18 and $34. Light options included salads, tar tare, smoked fish, mussels. The grilled asparagus was nicely charred and smoky with a good kick of salt. We could have ordered the kitchen to go a light on the olive oil to make it even healthier. 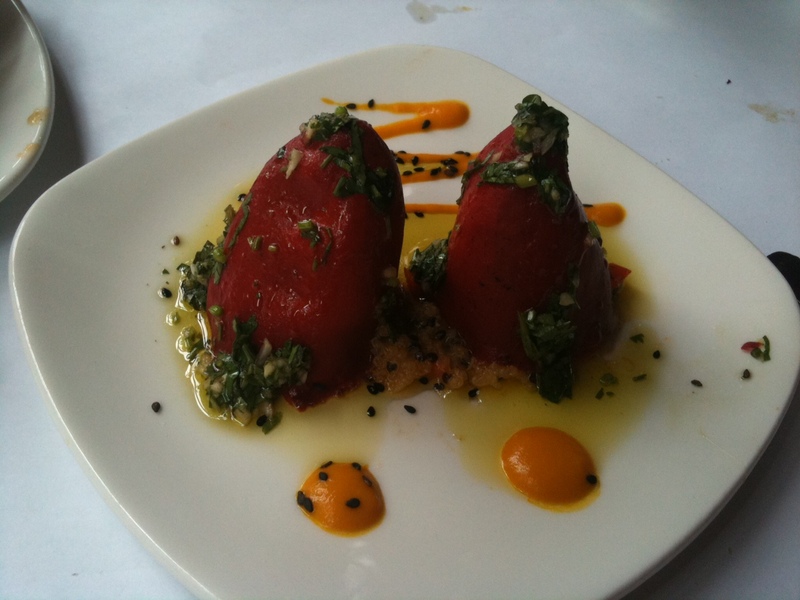 Two gnomes — actually piquillo peppers stuffed with cheese, quinoa and bits of Serrano ham — also turned out to be pretty light. A plate of roasted red and golden beets, served with tart pickled vegetables and a mint-and-jalapeno salsa verde was the freshest take on a beet salad I’ve seen in years. Again, it might have been wise to ask the kitchen to go light on the olive oil. 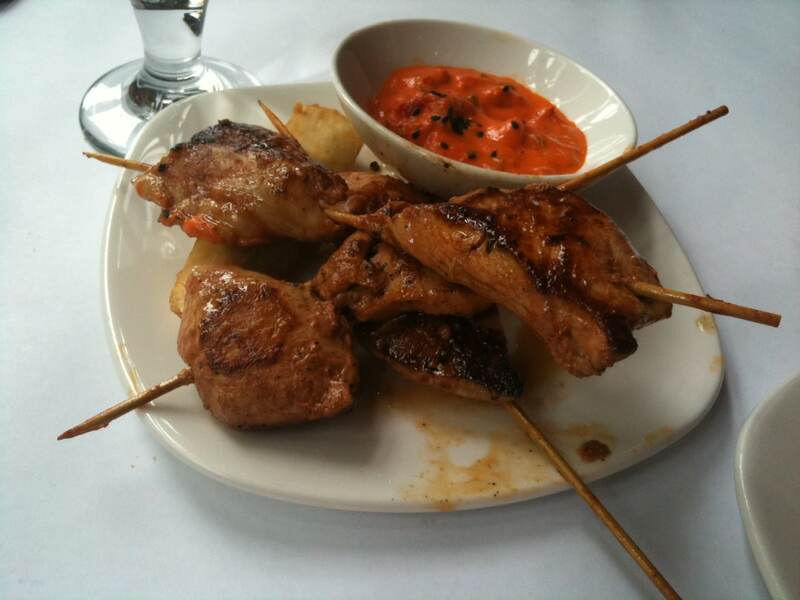 Given the oil quotient up to that point, I’m not sure why we misstepped by ordering the marinated chicken kabobs, served with a spicy salsa de rocoto. The word “marinated” should have been the hint. It almost always means that the dish has waded all day in a pool of fat before coming to the table. In fact, lunch would have been perfect had I only remembered to tell the kitchen: Go light on the oil.